May 2017 heralds an exciting debut collection by Emily Cataneo released by Journalstone Publishing. 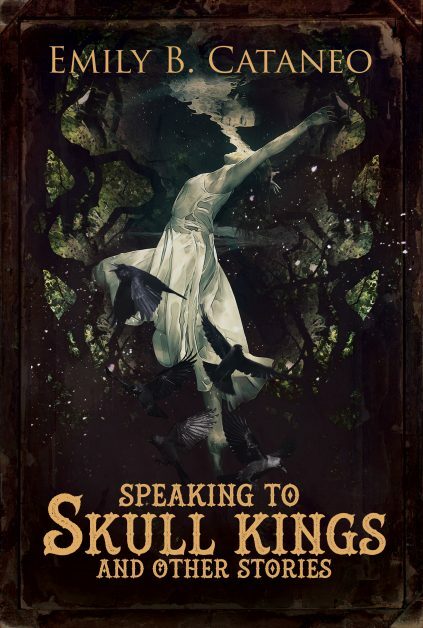 It features twelve short stories with intriguing and other-worldly titles such as The Emerald Coat and Other Wishes, The City Dreams of Bird-Men, The Rondelium Girl of Rue Marseilles and of course, Speaking to Skull Kings. Emily Cataneo has been making waves as an up and coming writer through having her stories feature in many prestigious publications such as Nightmare, Interzone,The Dark, Black Static and Lackington's Magazine. I really enjoyed reading this, a really original and thought provoking body of work. Throughout these twelve tales is a really strong female element which I loved. The writing is very beautiful but the subject matter and themes are very dark at times representing the worst of humanity. There are many themes such as abandonment, guilt, revenge, retribution, salvation, and a burning curiosity with what lies on the other side beyond our borders. It's really hard to classify these stories, they are elements of many different genres such as science fiction, fantasy, horror, and paranormal but added in all together in a very unique formula they make for some delightfully strange stories. The influences for these stories range from Victorian Spiritualism, Russian Revolutions, Medieval Europe, alternate universes that exist parallel to ours. They are tales of mad kings, crazed scientists, people longing for escape from reality, and ghosts. For me the stand out tales are (although they're all great,) The Rondelium Girl of Rue Marseilles, Not the Grand Dukes Dancer, The Emerald Coat and Other Wishes. The imagination used to dream up these stories is astounding. I also really enjoyed Hungry Ghosts and The Ghosts of Blackwell, Maine. What's really special about Emily Cataneo's writing is that it is really moving and poignant. You really feel that you're in there with them experiencing that moment through them. Speaking to Skull Kings and Other Stories is out in May 2017 through JournalStone Publishing. Go forth and buy it!